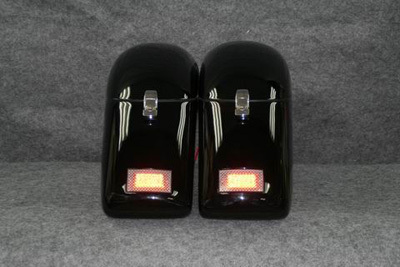 The TKY Strong Hard Saddlebags are designed with the purpose of providing a safe and reliable storage, while also creating the perfect look on your motorcycle by perfectly following the contour of your motorcycle fender and adding an additional touch to your bike to bring your machine to another level of design aesthetic. 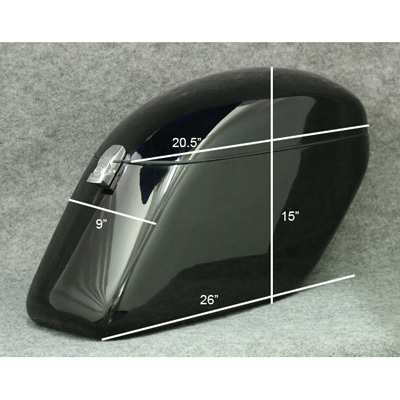 The TKY Strong Hard Saddlebags easily fit on most metric cruisers and touring motorcycles to give you a wide range of motorcycles which the hard bags may be paired with (refer below for a specified list.) The bags each contain 26 liters of storage capacity per bag and include all necessary mounting hardware for an easy installation. The bags come with chrome plated lockable latches and alloy front hinges to keep your items safe while also providing a durable design. Aside from keeping your items secure within the lockable hard bags, the carpet lined interior featured within the bags will also protect your valuable items from scratching and bouncing inside the hard saddlebags. TKY's Universal Mounting System: The mounting brackets are made of very strong, thick, quality stainless steel. Serving as the main element in the mounting system, the TKY brackets are nearly impossible to bend in normal use. Free of vibration and bringing life-long durability, with our mounting brackets, you may install your hard bags wherever you want them to be. Your hard bags will stick very close to your fender and you may install them in a very low position, even just above the pipes! All mounting brackets, bolts, and metal washers are made of quality stainless steel featuring a durable, strong, and reliable construction. 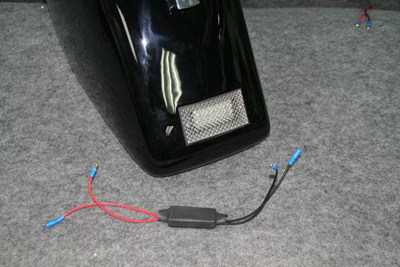 TKY's mounting system is that they fit very closely to your fender, comparison with mounting system of other leading brand. Cast Stainless Steel mounting brackets, much stronger than iron or aluminium. 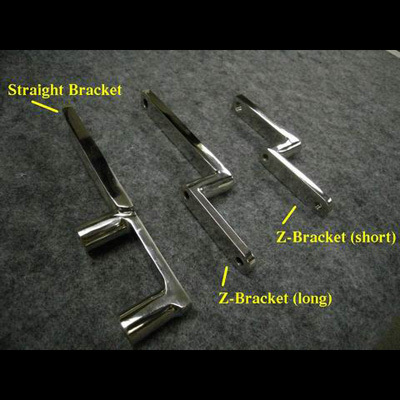 New Designed Z-bracket(long) (NEW!) and Z-bracket(short) (NEW!) 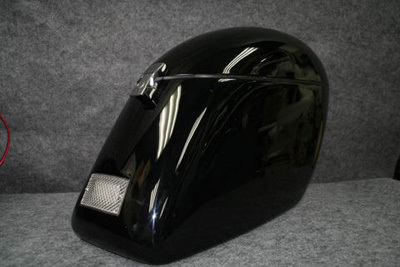 for Harley Davidson Softail, Dyna, RoadStar, Roadliner, VTX, and all other motorcycles with belt guards. Specfic brackets will be provided depending on the bike model selected. Same Hinges and Locks: Quality chrome plated front hinges and lockable latches, with keys. Hinge area is shorter at the front, more leg room for the passenger. 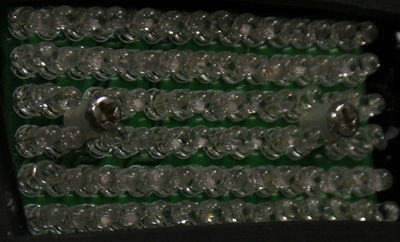 These LED lights are not add-on accessories, they are embedded in Hard Bags and cannot be sold separately. Amber in color. Color can be changed into Red based on request. Please send us email for this request. 48 super bright LEDs inside. 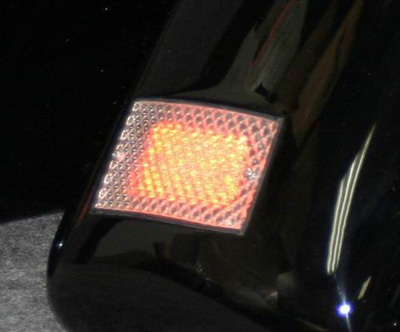 Note: Stock signals should be relocated for bikes with (*), you are suggested to order HardBags with LED Turn Signals for those bike with (*). 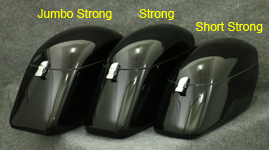 "Strong" saddlebags fit with backrest. 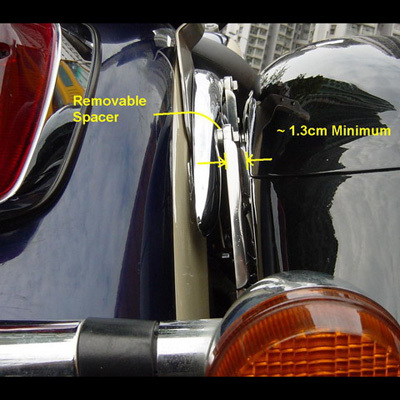 If you are using backrest which attached to the fender struts, longer mounting bolts maybe necessary.